Marketing is essential for the success of your business. It’s the way in which you generate new sales leads and ensure the revenue arrow keeps pointing up. This is a universal statement. It’s why we’ve gone into the marketing field and why we spend so much time developing marketing strategies for our companies. However, not everyone thinks like this, and people often need concrete evidence to back up the claim that marketing is so important for business. But, can you blame them? When dealing with your company’s time and resources, it’s essential you know that every dime is being spent to help further the company’s central purpose. 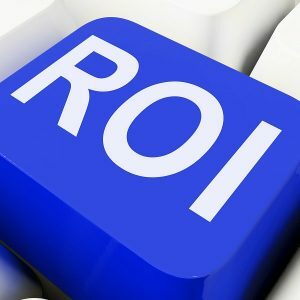 This is why measuring your marketing return on investment (ROI) is so important. It provides a tangible measure for how much your marketing methods are affecting the business, helping you decide which ones to pursue, continue or shut down. A critical first step in any attempt to measure marketing ROI is to figure out where you stand now. The ultimate goal of measurement is to demonstrate the value of these marketing efforts to the overall business, so it’s important to have a starting point. This needs to be the first step in any campaign. Then, as you go through it and when it’s finished, you’ll be able to look back and document the improvements you’ve made. Now on to some concrete methods of measuring ROI. This is a particularly good way of measuring ROI, especially when you are using digital marketing tactics. Essentially, you use tools such as Adwords and Google Analytics, to track the interactions between your company and its customers. This is valuable in that it tells you how much revenue is being generated from certain tactics, and you can compare this with customers who did not receive this exposure, helping you determine the true effectiveness of your campaign. It’s important to note that not every marketing tactic should be measured using both first and last touch. For example, social media is considered to be an early-funnel technique, implying it’s responsible for generating leads and demand for your product. Therefore, measuring social media through last-touch techniques is likely going to understate its value, as few people go from social media right to your site to buy something. However, people do learn about products on social media and then will end up on your site after doing some more research and informing themselves about their options. On the other side of this are search terms. It’s a good idea to measure these with last-touch methods, since people searching for specific products are usually closer to the end of the decision process. If you are not using digital marketing strategies, the challenge you’ll face is in determining where these touches came from. This will usually come in the form of asking customers to identify how they heard about you, and this data can sometimes be hard to come by. This is a fantastic tool and a rather scientific, way of measuring marketing ROI. Basically, you perform an experiment, exposing one group (the test group) to a certain tactic and not doing so to the other group (the control). From this, you can discern the effectiveness of your efforts and determine how much of an impact they are having on overall revenues. This tends to be more costly and time-consuming, but the insight it provides is really valuable. People have been focused on quantifying the effects of marketing for years. Gone are the days where marketers have to plead with bosses to keep their jobs, but there is still a tremendous need to determine how much these investments are affecting the business. Consider these tried and tested methods for doing this so that you can determine how well your marketing investments are paying off for your business. Jock Purtle is the founder of Digital Exits, a brokerage service which caters mainly to small and medium businesses. He has started and run several businesses throughout his career, most of them online and considers marketing to be the key to success.